Gordon Williams has developed cheat sheets for ARM dev boards. He writes, “I got pretty frustrated working with ARM development boards – every time I’d choose a pin for some function I’d find out that it was used for some peripheral on the board – so it either wouldn’t work or it would break something else! So I just compiled a graphical cheat sheet for the boards. 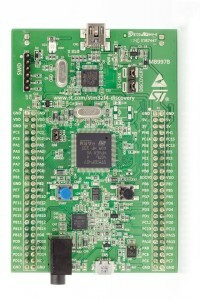 For example, here’s one for the STM32F4 Discovery. If you hover over an item (for instance ‘MEMS’) a tooltip will tell you what the pin does. The full list of boards I’ve done so far is at Espruino. This entry was posted on Friday, August 9th, 2013 at 3:14 am	and is filed under ARM, dev boards, documentation. You can follow any responses to this entry through the RSS 2.0 feed. You can skip to the end and leave a response. Pinging is currently not allowed. Neat! I dream of a web-based tool that could import data from e.g. Eagle/gerber/whatever files and present connections in nice graphical form. Beautiful work, the color coding is magnificently useful.